Document No. JO.1.2 Flight Manual in hard cover, 74p, c.March 1958 with amendments to 1963. 'Jackaroo' G-A010 Engine Log Book (H/b) with maintenance receipts etc c. 1970 - 78. Thruxton 'Jackaroo' Service And Instruction Manual, p/b, 28p, c.October 1957. Thruxton 'Jackaroo' Service And Instruction Manual, p/b 63p, c. September 1958. 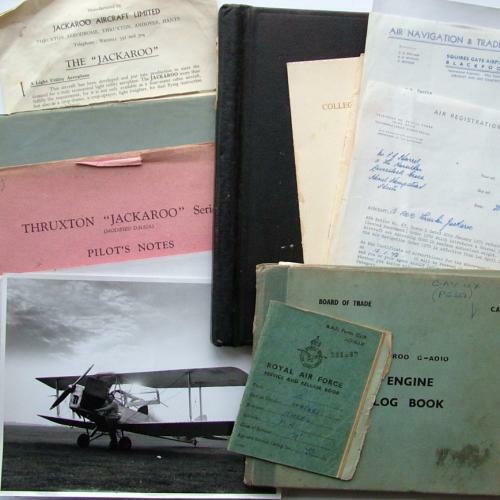 Original sales documents (2 sheets foolscap), original photographs (10x8" x 3),; assorted photos; college of Aeronautics Society menu and open day programmes c. 1956/57/59; sales documents/receipts and a RAF Service & Release book c.1946-48. All the information is perfectly readable but the covers of the paperback manuals are soiled, creased and dog-eared with small tears etc. Interesting documents. Stock code P21366.